We put an offer down on a house! It’s in Chicago and is what I would call a refinished vintage gem. We’re waiting to hear if our offer is accepted so please cross your fingers for us! We should find out later today or tomorrow. Now if you’re not on the muffin train yet, I’m here to convince you to try these spectacular banana oatmeal muffins. I realize it’s the hottest month of the year, but these protein packed muffs are waiting to be inhaled. Tony loves them spread with globs of coconut butter (which might be his new obsession). 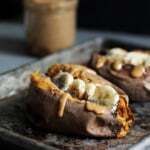 When creating the recipe for these I wanted to make sure they were actually filling, so I chose protein and fiber-rich ingredients like almond butter, greek yogurt, oats and eggs. 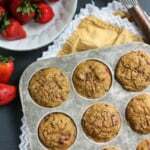 The almond butter replaces any oil that would normally be used in a muffin recipe. It also adds a slightly sweet nutty flavor and brings the muffins up to 6g of protein per serving! Not too shabby, huh? To jazz up the muffins, you can use any of your favorite almond butters. My favs include Wild Friends vanilla espresso, Justin’s vanilla almond butter and Barney Butter coconut chocolate. If you aren’t into almond butter or have an allergy, feel free to use cashew, peanut or sunflower butter! 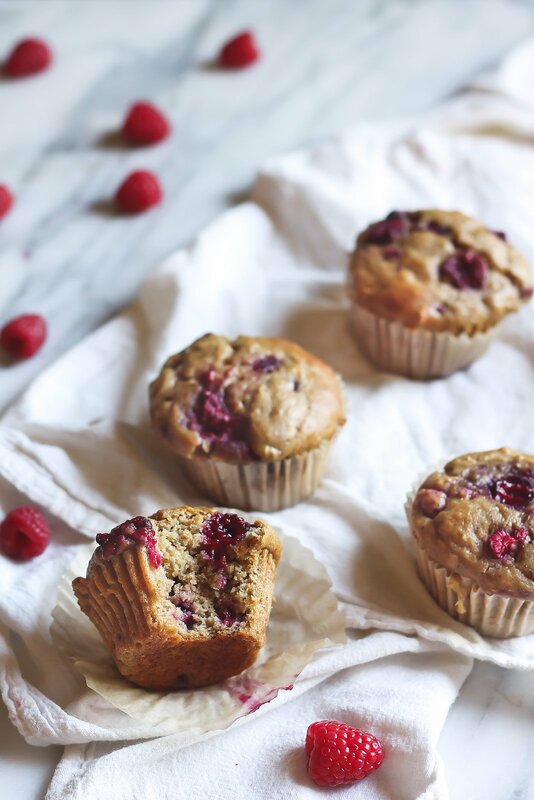 Hope you love these healthy raspberry studded muffins! If you make them, please let me know by leaving a comment below or tagging me on Instagram with #ambitiouskitchen! xo! 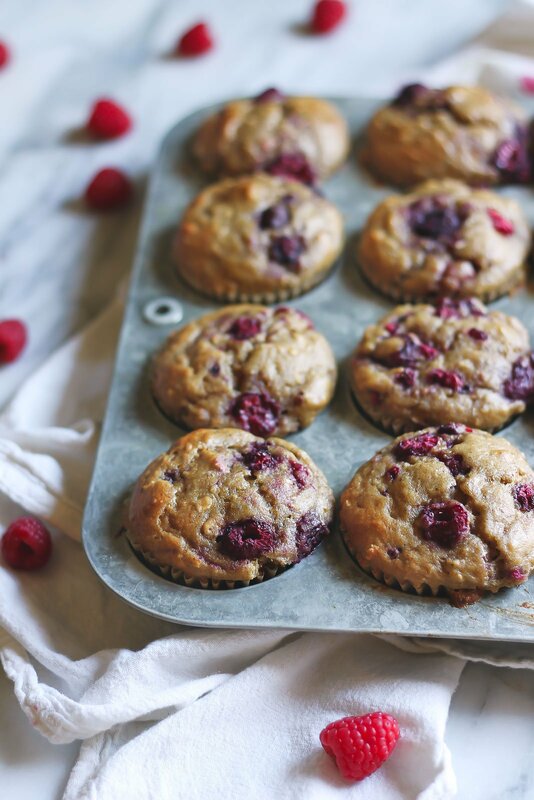 Healthy banana oatmeal muffins bursting with fresh, juicy raspberries! These amazing muffins are made with whole grains, greek yogurt & almond butter -- ingredients you can feel good about! Preheat oven to 350 degrees F. Line muffins tins with muffin liners and spray the inside of the liners with nonstick cooking spray to prevent sticking (yes, this is an important step!). In a blender, add bananas, oats, greek yogurt, almond butter, honey, almond milk, eggs and vanilla. Blend about 30 seconds. Pour wet ingredients into a large bowl, then add in dry ingredients and mix until just combined. Fold in raspberries. Fill muffin cups 3/4 of the way full. Bake for 20-23 minutes until tops are lightly golden brown. Transfer muffins to wire rack to cool. Enjoy with extra nut butter on top! Feel free to use a different nut butter such as: cashew or peanut. Sunflower will also work, but your muffins may turn green due to the fact that the seeds contain chlorophyll which reacts with the baking soda/powder in recipes when heated and then when cooled, can turn green. I have not tried to make these gluten free, but I'm guessing you could easily sub out the whole wheat flour for oat flour. 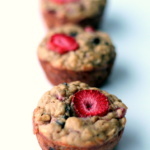 41 Responses to "Raspberry, Almond Butter & Banana Oatmeal Muffins"
Congrats on putting down the offer! So happy for you both! 🙂 Muffins really are glorious, love the combo of all the ingredients. These look so good! Will definitely have to make these for the family soon! Congrats on the offer! What neighborhood is it in? 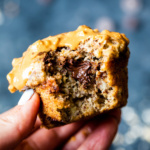 I love that you included almond butter in these! I bet that makes these taste even better, plus that is some serious filling power in it! That is essential in muffins 🙂 These look beautiful and the raspberries in it sounds amazing! congrats! and like you said, i love that there’s so many good (for you, and delicious tasting!) ingredients. raspberries are always a bit of a treat for me, and i love the heartiness that oatmeal lends to baked goods. I can not wait to make these muffins!! 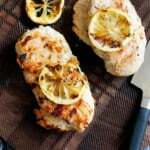 Thanks for sharing so many wonderful healthy recipes! So happy that I found your blog!! Congratulations on the house offer! Keeping my fingers crossed for you. 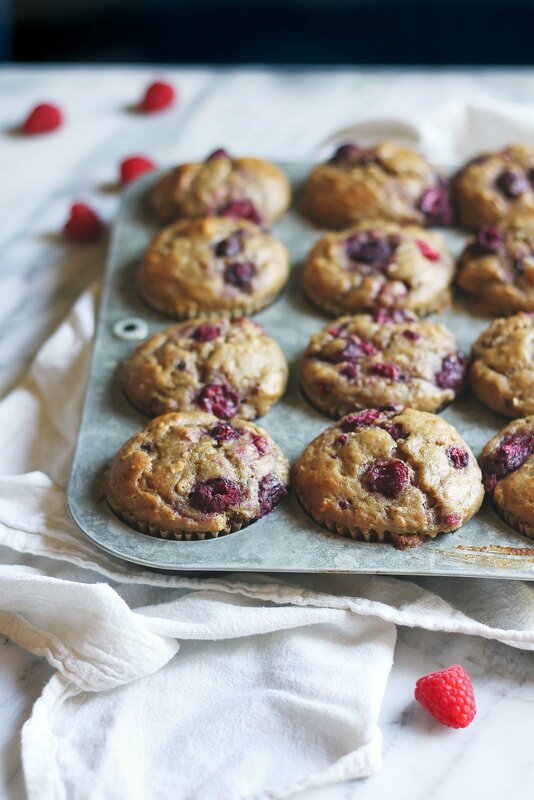 And in the meantime, I’ll be daydreaming of these beautiful muffins! What can I sub the Greek yoghurt with? I am lactose intolerant. These muffins were absolutely delicious! I didn’t have raspberries, but did have blueberries and they still turned out great! Thanks, Monique! Congrats on the house by the way! We made them yesterday and our guests loved them. I added some strawberry as I love everything with strawberries. I made these the other day and they were an instant hit! I was amazed at how tender and moist they are – I wouldn’t have thought it was possible to achieve such a great texture without adding butter or oil! Thanks for another great recipe. Oh me oh me of my 😀 I have to make these muffins STAT! I just made these and they’re fantastic! I used peanut butter and strawberries, and used half the amount of honey and doubled the recipe because I’m breastfeeding and I need all the easy, protein-filled snacks I can get 🙂 Thanks so much, I’ll definitely be making them again! Such springy muffins with so many awesome ingredients! gluten free works super! Still light and fluffy and amazing! (We used Krusteaz gluten free flour blend). To sub the yogurt, can use coconut or soy yogurt, or coconut milk -just a splash, so as not too much liquid. Just made these today and love them! Will be sharing for sure. Happy to have found you! Wow these looks absolutely delicious. I haven’t tried making muffins with raspberries before. I will definitely give yours and try! These muffins are awesome! Moist, just a bit sweet and a lovely nuttiness from the nut butter. My favourite part is how quick they come together in the morning. I use my silicone muffin trays to bake these so i don’t have to use spray, and they come out beautifully. Thanks for the recipe – a go to family favourite! I am so grateful that you go through the hard work to create recipes and that you share them. 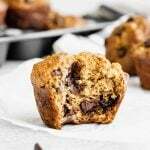 This muffin recipe is fabulous and easy to make. I did add a few chocolate chips, as recommended by someone else. My picky 15 year old likes them – double win! I’m so happy you’re enjoying these recipe, Susanne! Chocolate chips in here sound perfect 🙂 and glad you’re 15-year-old likes them, too! I made these with dairy free yogurt and flax egg and the muffins were super moist, didn’t stick to the paper, and really delicious! 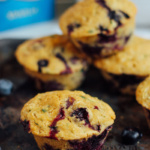 I love the ingredients and don’t feel guilty about eating a few too many muffins! I subbed half of the whole wheat flour for almond flour, and subbed whole yogurt for nonfat amd maple syrup for honey. Seriously amazing. Thank you! Glad those swaps worked out for you! Love these for a quick breakfast or snack.